Is there anything better than the simple comfort of pasta with the simple deliciousness of taco seasonings? I think not. I’m not sure why the idea to combine the two took me so long to figure out, but I’m glad I finally did! This simple recipe combines my taco seasoning with fridge-forage veggies and cooked pasta. It’s a riff on pasta salad, which means you can serve it cold or hot and everyone will celebrate. The possibilities are endless: serve this with chicken, or meat free; with shredded cheese or dairy free; and always load on the veggies to make it a one bowl wonder. This works perfectly for dinner and for lunchbox leftovers. If you’re looking for more pasta ideas, I’ve got you covered! If you make this, I’d love to hear what you add! Tag me so that I can see! Combine all of the sauce ingredients in a small bowl and whisk together. Set aside. In a large bowl, add cooked pasta with chopped veggies and toss to combine. Add sauce and toss again to thoroughly combine. Potatoes + onions + eggs + spices = divine combination. Right? My family traveled to Brazil and Argentina this summer to visit family and celebrate my brother in law’s wedding. Visually and culturally, the trip was magnificent! It was a culinary eye opener for my kids, and somewhat difficult at times for one of my kids and for me to handle the amount of meat consumed. We don’t eat so much red meat at home, but in Brazil and Argentina, it’s ubiquitous. One bright light: in Buenos Aires, my aunt wowed us with her Tortilla de Papas, an Argentine riff on the classic Spanish dish, Tortilla Española. In the classic preparation, chunks of potato are fried in olive oil with onions and spices until they have beautifully browned edges, and then eggs are added. Once flipped, this omelet seals the deal as a simple, yet filling and comforting rustic dish. My aunt can make this with her eyes closed, and it’s absolutely delicious time and time again. But wow, it’s a messy affair! Oil splatters everywhere, and the need to pour out some of the excess oil is potentially a hazard. In general, not the kind of dish that I would personally want to make over and over. Once home, I tried my hand at her recipe many times, and tinkered with it until I reached a dish that I would be happy making on repeat. Instead of frying in a cast iron pan, I’ve roasted and seasoned the potatoes and onions, then baked the whole thing with eggs. The roasted flavor carries over beautifully here, and you won’t need to wipe up all of the oil spatter from frying. This dish can be made in multiple sizes, with the only adjustment made in the cooking time. It’s homey and comforting, and easy enough to make on a busy weeknight. I love this dish because it’s also hearty enough to have as a main dish. If you make this dish, post it and tag @lalalunchbox and #lalalunchbox on Instagram. 2. Lay out the potatoes and onions on a baking sheet lined with parchment paper, drizzle with olive oil and sprinkle with paprika. 3. Roast for approximately 35-40 minutes or until the potatoes and onions are nicely browned on the edges. 4. In a separate bowl, scramble the eggs and add salt/pepper to taste. I added just under one teaspoon. 5. Combine the roasted vegetables with the eggs and pour into an oven safe dish. You can line the top with roasted onion rings to make it look pretty. 6. Bake for approximately 30 minutes or until the eggs are just set. The humble egg is a family favorite. It's a quick, healthy solution for breakfast. A reliable standby for lunch. A welcome change for dinner. 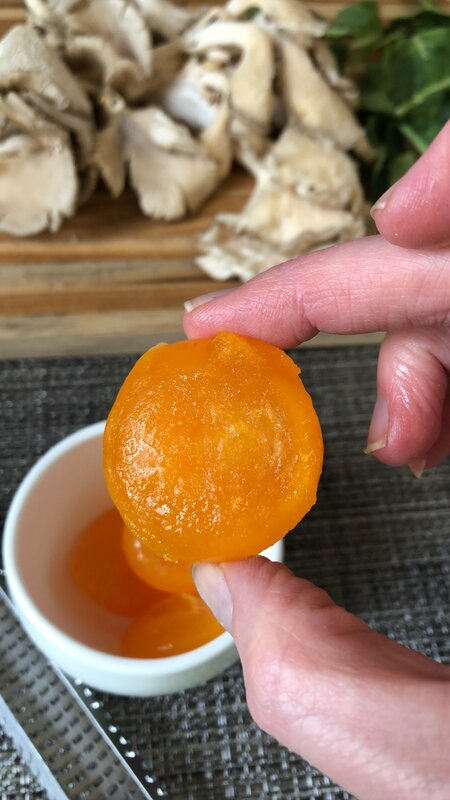 When I came across something recently about cured egg yolks, my curiosity was peaked and I had to dive right in. I've tinkered with the original recipe from Bon Appetit slightly, and am looking forward to continuing to experiment with it. Cured yolks add a salty, creamy depth to dishes. I grate them over pasta, over salads, on simple steamed vegetables and on top of several types of toast. They add an umami dimension that is eminently satisfying. Here's my favorite part: you can use them in place of a hard, salty cheese to make a dish dairy free. I used four yolks each time I made this recipe, and because a little goes a long way, they last a long time. (Make sure to reduce the amount of added salt to a dish if you plan on adding cured egg yolks). You can see the step by step process that I used below, or follow along on my highlighted Instagram Story. Preheat oven to 150°F. My oven only goes as low as 170°F, so that's what I used. Brush salt mixture off each yolk, then carefully rinse under cold water to remove any remaining salt (yolks will be semi-firm, and bright, as shown below). Gently pat dry with paper towels. They'll look a lot like glacéd apricots. Generously coat a wire rack set inside a rimmed baking sheet with nonstick spray; place yolks on rack. Dry out in oven until opaque and texture is like a firm Gruyère cheese, about 80-90 minutes. You can experiment with the timing of this based on how firm or soft you'd like your yolks. When the cooking is done, let them cool. They will last up to a month in a refrigerated airtight container. Top left: here we've got sourdough toast with labne, avocado, thin slices of cured egg yolks, microgreens and fresh ground pepper. Top right: simple salad with micro greens, baby arugula, purple radish and grated cured egg yolks. Bottom left: fresh pasta with oven roasted oyster mushrooms and baby kale with grated cured egg yolk and fresh pepper. DIY Toast with cured egg shavings, guacamole, radishes and lime. Polenta with roasted cremini mushrooms, scallions and cured egg yolk. Between work and the early evening shuffling to tae kwon do, gymnastics or whatever else, getting a healthy dinner on the table quickly feels overwhelming at times. You too? One of my go-to weeknight dinners when I'm short on time has just four ingredients, takes less than 30 minutes to pull together and is really affordable. Here's my favorite part: all five of my family members love it! 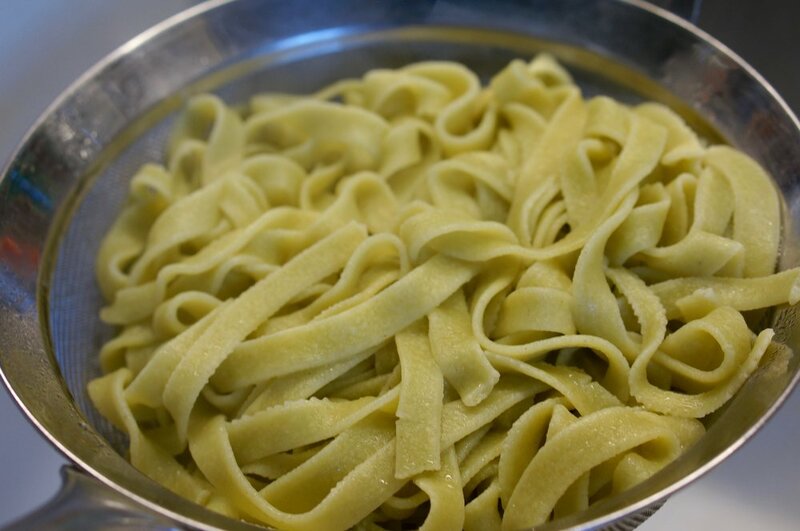 But back to the pasta... the four ingredients you'll need are pasta, eggs, butter and salt. I'm sharing my recipe with you now and hope that it serves you as well as it has served me for years. You can make it completely dairy free by substituting oil for butter. 1. Cook the pasta as directed, reserve 1/8 cup of the cooking water and set it aside. Drain the rest of the pasta and set it aside as well. Here I'm using fresh spinach noodles, but really, anything will do. 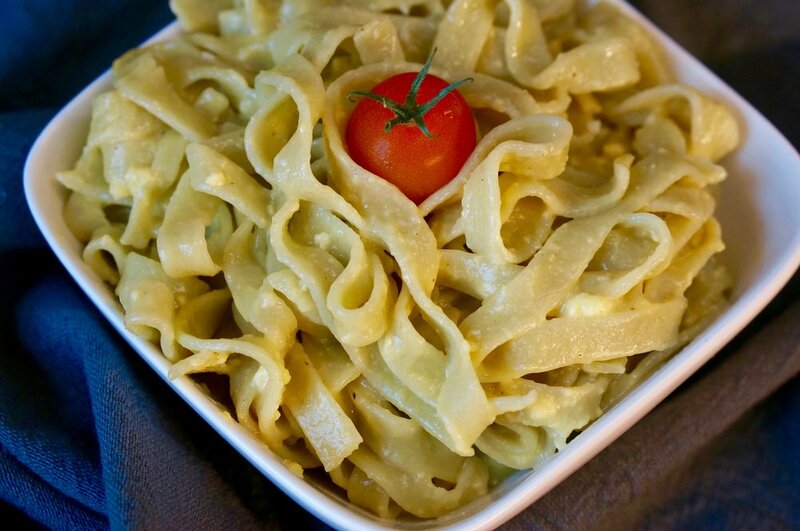 I've also made this with gluten free, bean pasta and it's delicious! 2. Add the butter to the pot that you used to cook the pasta and turn the heat on medium low. 3. Add the pasta back to the pot and stir to combine the melted butter. Add the reserved cooking water and then slowly add the eggs. 4. When you've added the whole eggs and the egg yolk, stir with a wooden spoon to break the yolks, add the salt and combine into the pasta. 5. With the heat still on medium low, keep stirring until the eggs just cook. It will form a rich, creamy sauce. Taste it to determine whether you'd like to add more salt (or add pepper). You might have some small egg clumps. That's okay. They're still delicious! Check to make sure the temperature on your stove isn't too high. 6. Have patience. It takes about 7-10 minutes of low heat for the sauce to set. These are best eaten immediately, but my kids also love them cold for lunch the next day.